A US jury has awarded damages of $20m (£10.3m) against drugs giant Merck in a case arising from its withdrawn painkiller Vioxx. The judgement means the jury may now move on to assess punitive damages against Merck. 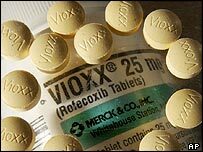 Vioxx was pulled from the market in September 2004 after a study found it could double the risk of heart attacks. The New Jersey jury ruled that Vioxx had contributed to a 61-year old man's heart attack. This was the second case brought by Mr Humeston after an earlier suit failed. Fresh evidence on the dangers of Vioxx prompted the new trial. The jury in the second case found that Merck had failed to provide adequate warnings about the health risks associated with Vioxx. Vioxx was launched in 1999 and became a best-selling anti-inflammatory drug, used primarily to treat arthritis. Merck faces some 7,000 outstanding lawsuits connected to Vioxx, and experts have estimated its potential liabilities in the matter at over $5bn. Sallie Booth, a partner at UK law firm Irwin Mitchell, which represents over 120 British claimants who used Vioxx, said the judgement was the latest in a string of US court case decisions. "We hope that each decision will clarify the position for all parties" Ms Booth told BBC News.